A half century in business is a major milestone in any industry, but especially one as competitive as motorsports. In his early years as an engine builder, Dan Olson learned how important a properly baffled oil pan is to cooling an engine and building horsepower. As a result of his success with Top Fuel boats and cars, he founded Dan Olson Racing Products in 1969, expanding his line to include oil tanks and coolers, exhaust headers, wings, and more. This year the company is celebrating "50 years of Dan's Pans," commonly considered the world's fastest oil pans. Spending much of his time on the road as tuner and crew chief to top teams, Olson turned the day-to-day operations of the business over to his son Brian in 1996, while he continued to rack up victories such as the 1999 Top Fuel Championship with Tony Schumacher. With Brian now overseeing 14 employees, the company continues to expand and develop its extensive line of products. 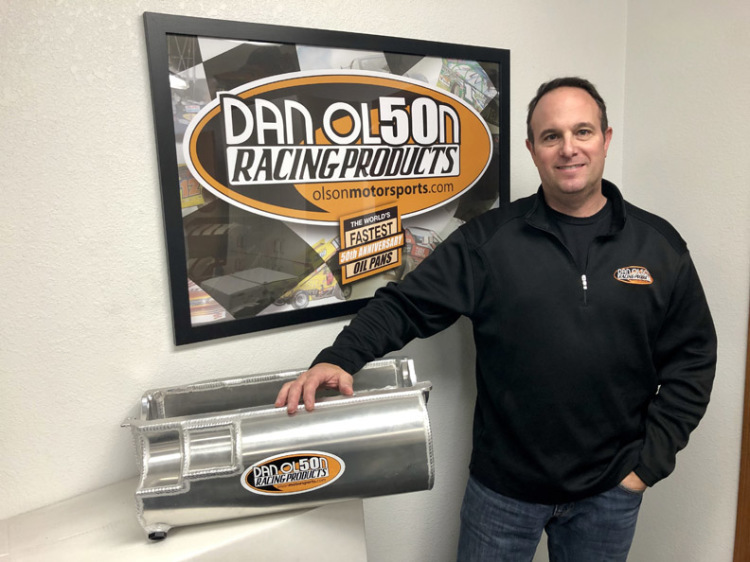 And while many businesses don't survive beyond the first generation, Dan Olson Racing Products has also welcomed Dan's grandson (Brian's nephew) Logan into the fold. Having worked in the shop since he was 16, he's just graduated college and will specialize in programming the CNC machines. While Brian admits that working closely with family can be difficult at times, he says the key to success is good communication. Tell us your story of how you got started in racing? Because of my dad, I basically grew up at the race track every weekend, whether it was the drag strip or one of the circle tracks. It's a part of my life, because it's pretty much what we always did as a family. I raced go-karts in junior high and high school, and started off in the business sweeping floors, cleaning the shop and cleaning parts, just doing miscellaneous entry-level tasks. After that, I got forced to go to college instead of racing, which probably saved a lot of money. I went to Cal Poly Pomona and Fresno State. I started off in industrial technology but actually got my degree in business marketing, which has served me well in the business. What is the most exciting thing to you about the motorsports industry today? Being around it my whole life, I think what I appreciate most is the great friendships that I've established over the years. I would say that more than half of our clientele are friends, not just customers, that I actually socialize with. Something I've always appreciated is that there is a real family atmosphere in racing. What motivates you daily in your job? I would say striving on a day-to-day basis to keep the quality that my dad has always expected out of our company. From when I first started, we've always tried to achieve the standards that he expects. That's something that he instilled in my sister and I as kids: When you do something, you give it your all, you do your best. That's just kind of how he's always gone about things, and that's how we operate. The biggest thing I've always tried to tell my guys is, as long as my dad would put this on his race car, I know we're doing something right. What recent new technology or advancements in racing excite you most? In racing as a whole, the technology never ceases to amaze me because it's just constantly advancing. It isn't new technology, but over the last 15 or 20 years, all of the CNC equipment that has come into the manufacturing side of things has really stepped up our productivity and the quality of the products we're able to produce. And in the last couple of years, especially, the CAM software allows you to do things you couldn't do before. We use Mastercam for our CNC machines, so we can do 3D models and stuff like that. While we don't use that as much, what it can do is help make a pan faster by giving you your bend lines and cuts and things like that. We have a CNC router that actually cuts from a sheet of material and it will cut the whole oil pan out, give you your bend lines and everything so that it's real easy to fold up in the press brake. What should everybody in the racing industry know about your company? That we've been around for 50 years and the quality of our products is always how we've stayed in business. I would say we've probably won more championships in circle track and drag racing than anybody out there, just because we're fortunate to have the clientele we do. Funny Car, dirt modifieds, late models, all the dirt circle track stuff. Like the Chili Bowl last weekend--that was our stuff on Christopher Bell's car. Like I said, we're very fortunate with the people we work with. We work with a lot of engine builders and some of the pro teams in-house, as well as with the Big Three car manufacturers that are into racing. For example, right now Tony Stewart is developing a new small-block sprint car engine with Ford, and we're working with those guys, too. Finally, most people don't realize how important an oil pan is and what it actually does. You can make horsepower with an oil pan, gaining anywhere from 20 to 30 horsepower.